Another weekâ€™s end brings another Weekend Project, and itâ€™s time to do your laundry! 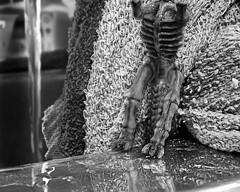 We had a popular thread several years ago with this theme, but never an official project, so your assignment for the next two weeks is to creatively photograph any aspect of how human beings launder their clothesâ€¦ from going to a laundromat, your own personal washer or dryer, a clothes line, dry cleaner, ironing board, etc. Anything or anyone that is used in the process of getting your clothes clean can be your subject. Laundry's never fun.... until you bring your camera! Laundry Day has 35 entries.